ESTES PARK, Colo. -- Climate change threatens the very existence of some of America's most treasured national parks and could dramatically alter the landscapes and ecosystems for which others are famous, unless steps are taken to reduce greenhouse gas emissions and mitigate the consequences of global warming. That was the message of expert panelists at a hearing held Monday by Sens. Mark Udall (D-Colo.) and John McCain (R-Ariz.) after the senators toured nearby Rocky Mountain National Park to get a sense of the changes that are already visible in the park, including a bark beetle outbreak that has destroyed more than 1.5 million acres of Colorado's lodgepole pine forests. "It's unbelievable," McCain said of the bark beetle infestation. "Every citizen should see what's happening here." Both senators stressed the importance of addressing climate change, although they offered no specifics on what should be done to tackle the issue. When it returns from recess next month, the Senate is expected to take up legislation that would for the first time set limits on emissions of carbon dioxide and other greenhouse gases widely blamed for global warming. McCain said addressing the implications of climate change in the national parks rises above partisan politics. "A common misperception is that this is a crisis that is down the road, a future generation's problem, or that global warming is limited to the distant reaches of the Earth," he said. "I've traveled the globe to see firsthand how it's changing the lives of people in Alaska, Australia, New Zealand, South America, Norway and other parts of the Arctic region, but the startling reality is, you no longer need to journey to faraway places to experience the effects of climate change." Last week, the two senators toured the Grand Canyon with Interior Secretary Ken Salazar to assess conditions there. "To a large degree, our national parks are the canary in the coal mine when it comes to the on-the-ground effects of a warming climate, and that's especially true for our Western parks and the park right down the street here from this hearing room, Rocky Mountain National Park," Udall said. "It's clear that these impacts are real, significant and can have lasting effects on our resources and our ability to protect them." Experts testifying at Monday's hearing offered details about what sorts of changes could be expected in park ecosystems in a warmer world, as well as the changes that have already been observed. They left no doubt about the seriousness of the threat climate change poses to the park system. "Climate change is potentially the most far-reaching and consequential challenge to the National Park Service mission in our history, challenging the foundation of the national park system and the ability to leave America's natural and cultural heritage unimpaired for future generations," said Herbert Frost, associate director of natural resource stewardship and science for the National Park Service. Frost noted that some dramatic changes can already be seen in the national parks. Melting sea ice in Alaska parks, for example, is threatening marine mammals and coastal communities, perennial snowfields are disappearing and thawing permafrost is destabilizing buildings, roads and facilities while disrupting the structural integrity of large land masses. Reduced snowpack associated with climate change could rob Rocky Mountain National Park's alpine streams of essential water, further stressing the park's flora and fauna, experts say. Photo courtesy of NASA. Coastal parks are also vulnerable, including 5,100 miles of coastline and 3 million acres of beaches, wetlands, estuaries, reefs and kelp forests that lie within 74 NPS units. At Everglades National Park, rising seas could overwhelm mangrove communities that filter out saltwater and help maintain freshwater wetlands and their species. Already, increased sea surface temperatures have led to coral bleaching and disease that has caused the loss of more than half of reef-building corals in the Virgin Islands' parks since 2005. But the impacts to park ecosystems are not limited to those on the coasts or the northern latitudes. Frost said warming temperatures are accelerating the melting of mountain glaciers and snowfields in national parks such as Glacier and North Cascades. In Yosemite and Great Basin national parks, high-elevation species such as the pika and alpine chipmunk are moving upslope. Much of the hearing focused on changes that have already been observed in the Rocky Mountains. Colorado is about 2 to 3 degrees Fahrenheit warmer than a century ago, according to David Schimel, senior scientist at the National Center for Atmospheric Research and one of the hearing's panelists. Additionally, winter snowpack is declining and the length of the snow-covered season is decreasing, resulting in more summer drought. "The historical record shows clearly that the effects of climate change are not yet to come but in fact are occurring right now," Schimel said. Based on past observations and current climate model projections, Schimel identified several impacts on resources in the Rocky Mountain region and in Colorado's national parks. 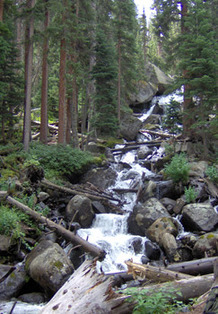 Among them are increased biological disturbances such as wildfire, mountain pine beetles and other pests and pathogens that flourish in warmer, drier conditions; reduced runoff and streamflow; less carbon storage in forests as warmer summers and earlier snowmelt lead to less tree growth and higher forest mortality; and the loss of native plant species. "These climate-driven changes pose dramatic challenges to resource managers," Schimel said. Schimel noted that declines in snowpack and generally shorter winters are contributing to drought conditions and robbing high-elevation trees and plants of vital water resources. A one-month change in the length of the snow-covered season could reduce by half the amount of carbon uptake by Colorado's forests, Schimel said. Stephen Saunders, president of the Rocky Mountain Climate Organization and a former deputy assistant Interior secretary under the Clinton administration, noted the serious challenge that climate change presents to national park managers. A 3-foot rise in sea level could mean the disappearance of places like Dry Tortugas National Park and Ellis Island National Monument, as well as significant portions of Everglades and Biscayne national parks, he said. "There is no question in my mind that human-caused change to the climate is the greatest threat that our national parks have ever faced," Saunders said. "We've never lost a national park before." Additionally, he said, some national parks could lose their namesake features. For example, Saguaro National Park could lose all of its saguaros, Joshua Tree National Park could lose all of its joshua trees, Glacier National Park could lose all of its glaciers and Virgin Islands Coral Reef National Monument could lose all of its coral reefs. Rocky Mountain National Park can also expect to undergo profound changes, Saunders said, including "less ice, less snow, less water, more wildfire, less meadows, less wildflowers." "It is going to be a very different park," he said. 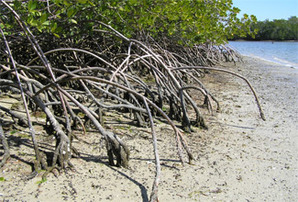 Experts say rising sea levels in south Florida could inundate Everglades National Park's extensive mangrove habitat, destroying one of the wetland park's natural buffers against saltwater. Photo courtesy of National Park Service. Of particular significance, according to Saunders, are projections that flows on the Colorado River, which begins in Rocky Mountain National Park, will diminish by between 4 and 14 percent this century. One-tenth of the U.S. population depends on the Colorado River for water supplies, and the river is a vital component of several national parks. But the greatest impacts of climate change in Rocky Mountain National Park will be large changes in the park's plant communities, as already evidenced by the mountain pine beetle epidemic that has decimated nearly all of the mature lodgepole pines in the park, Saunders said. Saunders, whose organization issued a report in 2006 that identified Western parks most at risk from the effects of an altered climate, said the Park Service has not done enough to address these threats, too often looking the other way or citing climate change impacts as external forces beyond the agency's control. "The National Park Service has not done its job yet," he said. Saunders cited a report issued by the Government Accountability Office that concluded that "resource managers have limited guidance about whether or how to address climate change and, therefore, are uncertain about what actions, if any, they should take." The panelists offered several suggestions to reduce and mitigate the effects they described in their testimony, including broad measures such as reducing greenhouse gas emissions and more limited efforts such as removing non-native tamarisk trees. Schimel noted that observations and modeling of climate impacts should be integrated in the same way that weather and climate models are to improve the forecasting of climate impacts and provide usable information about climate change impacts to resource managers. The current observing systems, analyses and forecasts are inadequate for providing park managers with the information they need to make decisions, he said. Saunders suggested that the park service create a separate office tasked with supporting NPS actions to address climate change and its impacts in parks. The Obama administration requested $800,000 for such an office for the next fiscal year, but the House appropriations bill would block its creation.